Earlier this month, I had the brilliant idea of going downtown OKC to a holiday photo booth to take fun Christmas pictures. I already had my Christmas cards printed, so this was just for kicks. But then I did some research and discovered that the pictures were going to cost $36 EACH. The adventure part of me said, Who cares! Throw caution to the wind! You're only young once! The budget part of me said, "That is insane. You have a self-timer. Use it." I'll let you guess which option I chose. 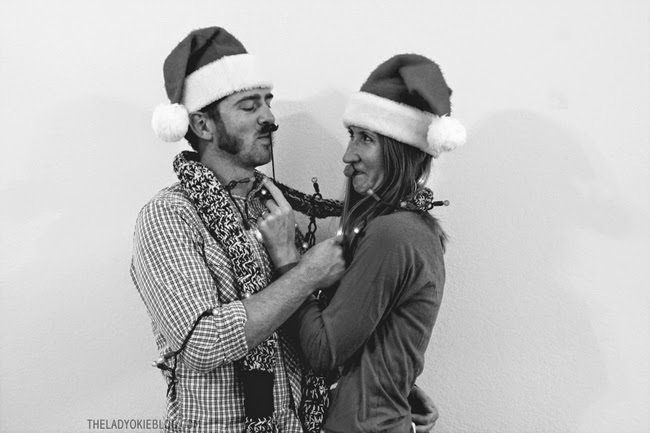 I love these pictures so much that I was *this* close to ordering completely new Christmas cards, but that would have definitely defeated the purpose of not paying $36 for a professional photo booth shot. I'm pretty excited that I got Jordan to play along with me. That is, until I made him nauseous from forcing him to spin the light strand around himself, and then the fun was over. 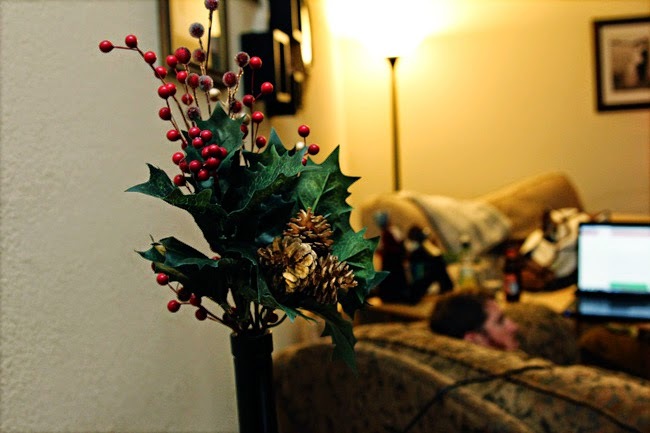 Christmas is the only holiday I actually decorate for. It's also the only holiday I have decorations for so there's that. I thought you might like to see some of my favorite decorations I have right now around the apartment. My friend Katie made this for me during a crafty secret Santa exchange. 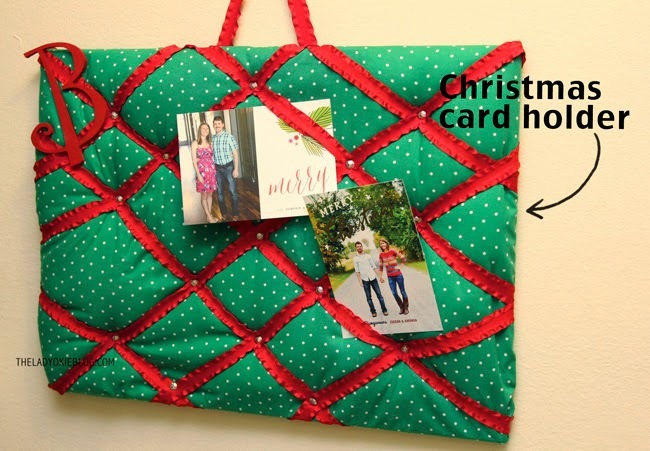 I hang it on the wall and tuck all of our Christmas cards into the red ribbon! It can get pretty full, but so far I haven't had an issue with anything falling out. Every year in November, my church hosts a "Jingle Bell Jamboree," where all the women of the church are invited to come and make a Christmas craft. I always have fun and make sure to go every year. This chalkboard Christmas countdown was the craft I made the first year I went, back in 2009. I painted the words and the red around the outside, the green and red balls, and created the tree out of strips of different kinds of ribbon. It's a little ghetto, but I love it! ^^This was the Jingle Bell Jamboree craft this year. This isn't a great picture, but it's basically a wreath-type thing. The craft part included bending the green parts to make the shape and then gluing the pine cones, berries, and bells into it how we liked! There's a burlap bow at the top too. ^^^This is our Christmas tree. Yes, it's tiny. Someday when we have a house, we will get a normal-sized tree, but until then we'll pack our ornaments and lights onto this bad boy. My grandpa gave this tree to me when I moved to Oklahoma in 2008, and I've put it up every year since. He even bought me the "snow" to put around the base. This tree is actually an antique! It's still in the original box from the 50s. The tree does not come with lights, so even though this tree is artificial, I still have to string lights around it every year. I appreciate my dad's light-stringing skills so much more now. Even with just a tiny tree, it's hard work! So that's what Christmas with the Bumgarners looks like this year! 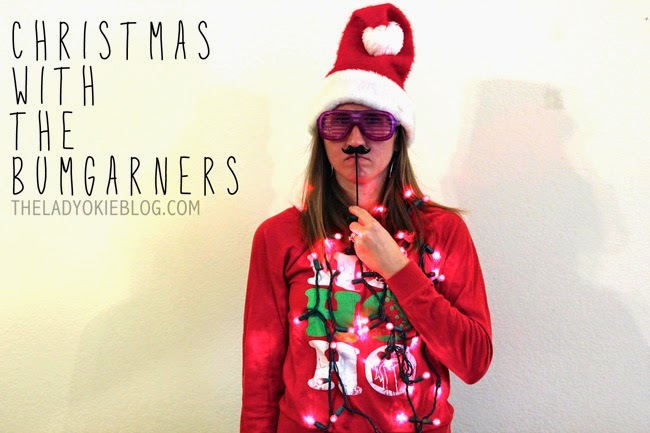 I've never really done anything like this on the blog before, so I hope you enjoyed it. 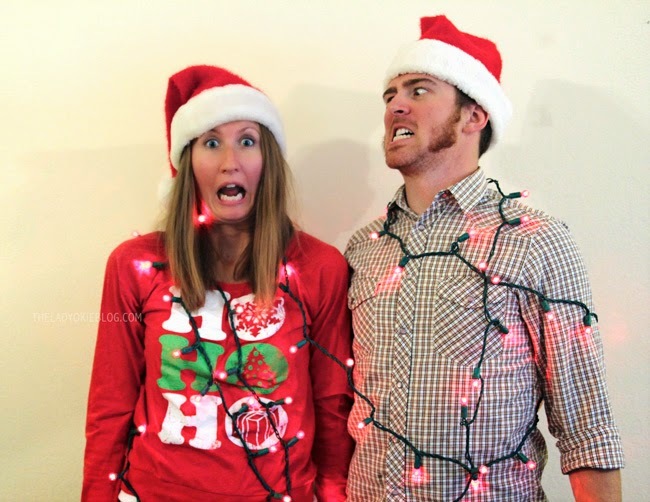 -How much is too much for a Christmas photo booth picture? 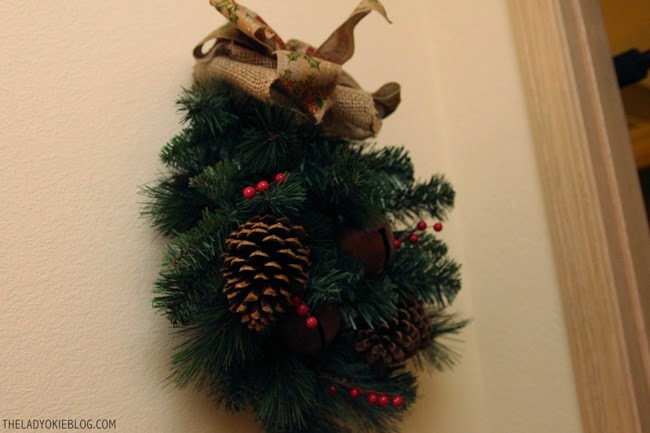 -Do you have any favorite Christmas crafts? p.s. My girls' weekend in San Diego was amazing! I have a lot of pictures to share, but I haven't had time to go through them yet, so stay tuned! Love your photos! :) And I also love that sweatshirt- another reason why Target rocks. 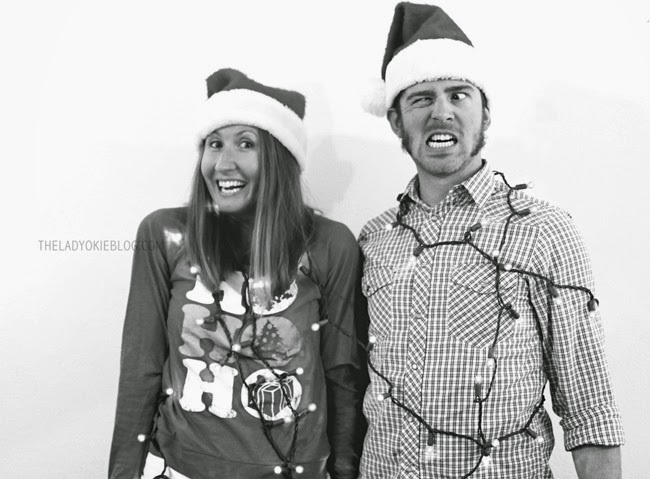 We just used one of our wedding photos this year for our Christmas cards. Cute pics! $36 is RIDIC. But for one photo, I basically think anything over $5-7 is crazy. "I'll let you guess which option I chose." <---I actually laughed out loud at that one. These are fantastic! Awesome replication of the photo-booth look. 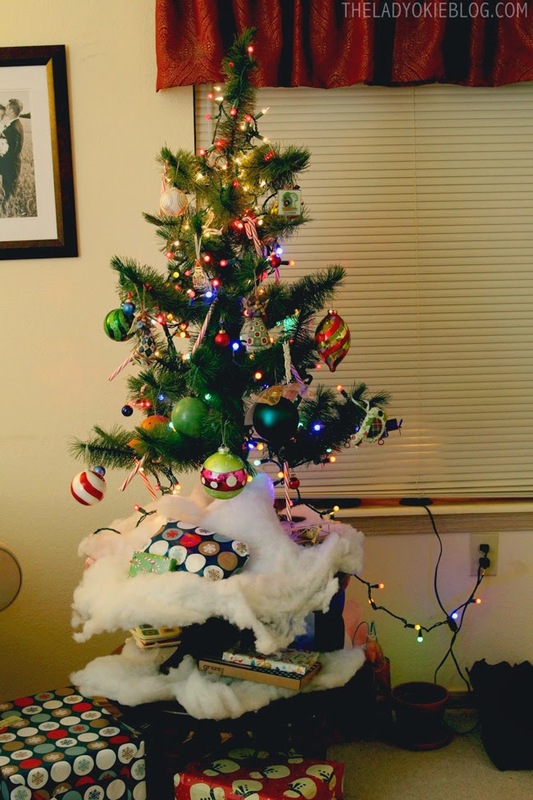 And I love your tiny tree. Christmas traditions and keepsakes given by or passed down through family are the best! Wishing you and Jordan a joyous Christmas! You guys are adorable. The end. what fun photos!! such a great (inexpensive) idea! I am really impressed with your crafting skills; the countdown chalk board looks great! I'm not that crafty, but I love homemade decorations. I agree that $36 is way to expensive for one photo. I'm starting to regret paying $22 for our mall Santa pictures. Mostly because we haven't given any out yet, but I'm sure we will - to the Grandparents at least. Thanks for giving us a tour! I love seeing other people's holiday decorations! So fun, I love this post! $36 is too expensive, I approve of your choice, would have done the same myself. 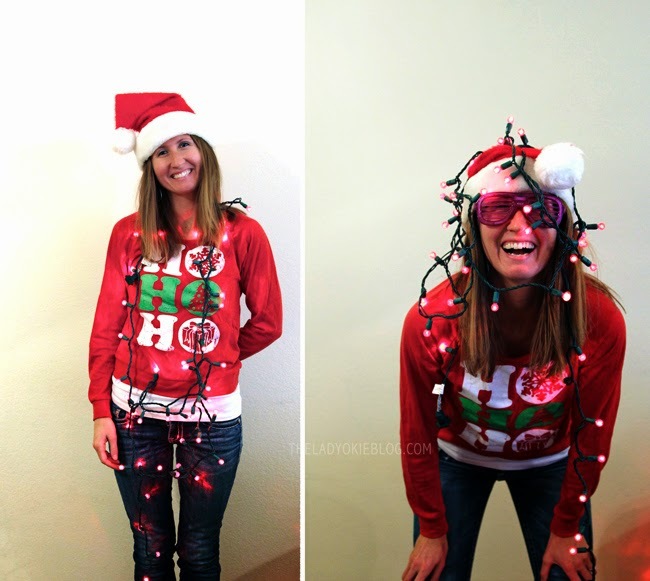 Your decorations are so pretty, but your tree is my favorite - too cute! Plus it's also an antique and has sentimental value, which makes it perfect. Have you gone downtown to Devon? So many people are taking pictures there. Loving all your decor- everything is super cute, and I love the personal touches with crafts you've made and a craft from a friend! :) Those are the best kind! I definitely couldn't have paid that much for photobooth pics and I think yours turned out super adorable!! i LOVE your pictures! good choice :) and love the card holder and chalkboard! Oh these are SO cute! Caleb and I did self timer in our living room and they turned out so awful hahah so we took a picture on Tuesday while we were at a Christmas play and were probably just using that one! I love how creative you guys got. I love the home made photo booth idea! You guys are the sweetest!!! Ya'll are way too cute!!! MUCH better than paying $36! What a rip off! I love the photos! Tyler and I should do some too! I can't wait to see your San Diego pics! I love the little tree and it's history. Even when you have a big tree someday - you must continue to put up that keepsake. Your photos - umm, adorable!! I would say over $5 each for Christmas is too much. MAYBE $10. Regardless yours are SO cute, you guys totally pull off the "we're cute and laughing and oh there's a camera" look and I LOVE it. I love all your decorations- can I borrow your friend to make me one of those Christmas card holders? because it is SO cute! Also... were those your own Christmas cards on there? If so, they look super adorable and appears as though you nailed that photo shoot as well. For the record, your countdown board does NOT look ghetto!! If that's your definition of ghetto then I'm wondering what you would think of my definition of ghetto (i.e. I've been wearing a black spaghetti strap tank top that has one strap held on by a paper clip because I'm too cheap to go out and buy another one... now THAT's ghetto). The whole idea of a Christmas Jamboree sounds absolutely delightful... can I come next year?? I would have to say putting lights on a Christmas tree is my least favorite thing to do (mostly because it's hard!) but Alex takes special pride in doing a good job of it and totally kills it every time. Super adorable photos and cute tree! I love how it's also nostalgic. Whenever you get a bigger home, you have to keep using it just because it's an antique and your grandfather gave it to you. Two trees are better than one. Also an apartment dweller, we have a small tree and way too many ornaments for it. When we look at potential places to move to, I always think, "Where would we put a new giant Christmas tree?". It's an important question. Your photos are too cute. The wreath is a great craft, it came out really well I have been slowly building my collection. Hahaha these are all so great! Love the one where Jordan looks like he's about to attack you! We have a tree that my husband's grandparents passed on to us but it is HUGE... in our little apartment! We still put it up and yeah, it takes me a couple hours to do the lights. Haha I'm definitely with the budget side of you on this one! I think anything over $10 is too much for a holiday photo booth. Or even $5! Yours turned out great. 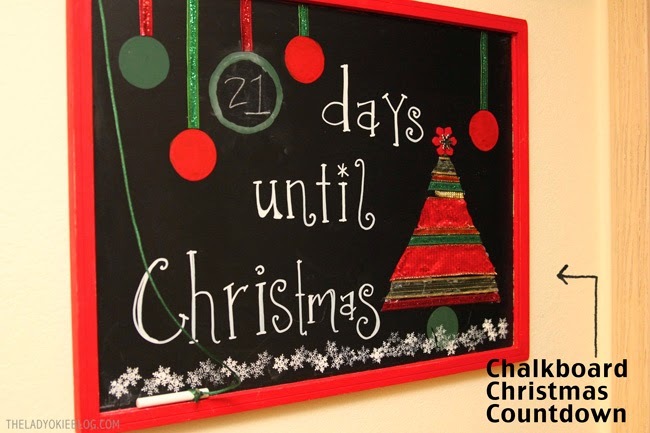 :) And I love your Christmas countdown chalkboard! I don't think it looks ghetto at all. :) Merry Christmas! These pictures turned out GREAT! I love them! Love love love those pictures! Michael will play along with a lot of things for me, but pictures is NOT one of them. We might have 5 together.. total. One for every year? Whatever. $36???!! Insanity! lol. Thanks to dave ramsey--I am pretty cheap! haha. Love what you did here. Jordan's eyes in that last photo are cracking me up. All of them turned out great! Beats $36 for sure! I absolutely LOVE these photos!! So fun!! And the Christmas card holder is clutch! I wish I was a part of a group that did holiday crafts each year! That is a fabulous idea! Love it! Hooray for the self timer! Your pictures turned out adorably! Also, your tree - how cute! I love that it's so old and has been such a good little tree for you over the years. So sweet. And all your decorations are precious! Hooray for Christmas! Christmas is the only holiday I've ever had decorations for--we had a tree, lots of ornaments, a nativity scene, stockings, lights, a Christmas village....the only thing we actually bought ourselves was the tree, haha! When you get married 3 weeks before Christmas, guess what everyone gives you? Christmas decor. That is really special that your Grandpa ga e you that tree...I'd keeo usung it too! Love these pictures! Girl, I'm with you. Any amount for photo booth pictures is too much when you have a decent camera and a self-timer. And these came out great! I also love your "ghetto" chalkboard - total inspiration to make one! I've wanted an advent calendar, but I like this idea instead! Hehehe, I love the photos! I think the black and white ones are my favorite. They made me giggle the most. :) I really love all of your decorations! I love displaying our past Christmas cards in one spot. We put ours on our Christmas tree tucked into the branches. It's fun to see how we've changed over the years! Wait a sec… I thought Jordan hated pictures?! I'm impressed that you got him on board! I don't think there's enough money in the world to PAY Riley to play along with something like this. Glad he did, because your pictures turned out really cute! :) I'm happy to see that someone has a tree even smaller than ours this year, haha. Although, the fact that yours is vintage makes it pretty darn cool. EXCUSE ME please tell Jordan his muttonchops are FABULOUS. ok, just stop. these are so stinking cute! AND FUN!!! and i love your decorations!! (also $36 PER CARD?!) stop. and those chops...i'm dying, so awesome. Great tour! I'm totally going to do a tour too (i.e. I'm stealing your idea). This was fun to read/see! 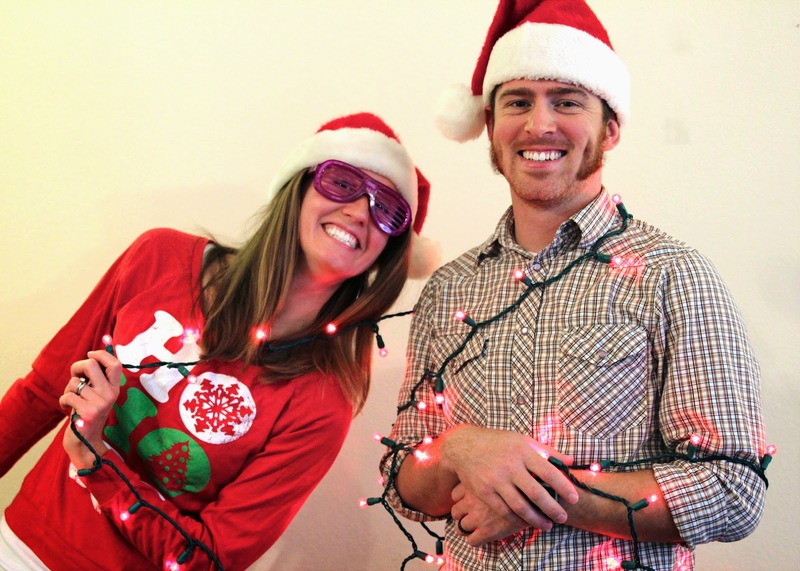 Oh, and $36 for each picture at the photo holiday booth? Total rip-off! Your pictures are much better than pictures from a photo booth.